$695.00 plus $30 shipping and insurance within the Continental United States. For local sales, shipping charge will be allocated to NYS Sales Tax. Please email me at JamieWG@aol.com for International purchases or with any questions. 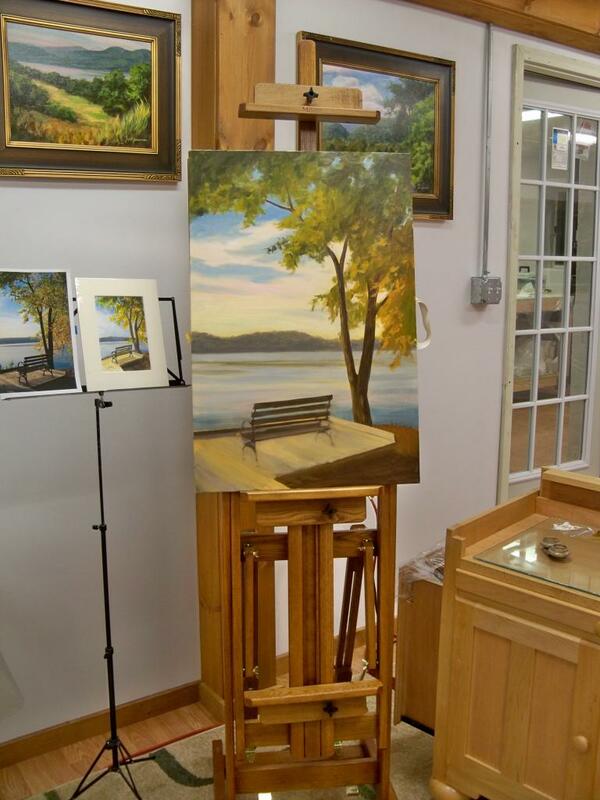 This is a painting done partially on location during the summer. 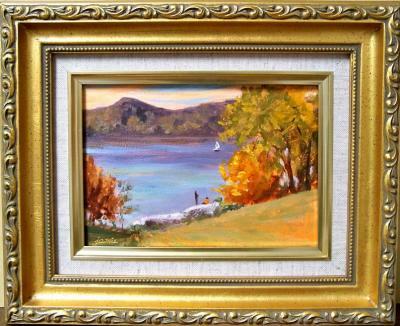 I drove around with my friend Karen looking for a painting spot near the Hudson, and we finally came upon this marina view in Catskill. 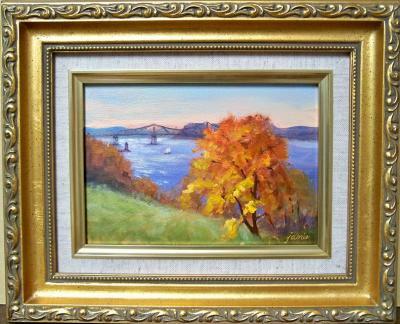 Around the bend in the painting lies the Hudson River. I loved the blue of this sail cover, and the colorful floats piled up on the bow, waiting for adventurous souls to go out for a sail. I didn’t have time to finish it on location and it’s sat in the studio for a few months now, just waiting for the finishing touches! I finally pulled it out this morning and finished it off. Many of my finishing touches are done at this ArtQuest desk. The easel part adjusts to any angle, and there is a support for a monitor/laptop. I use the keyboard shelf for my palette. I love this thing! These images are looking quite dark to me, but the painting is not this dark. 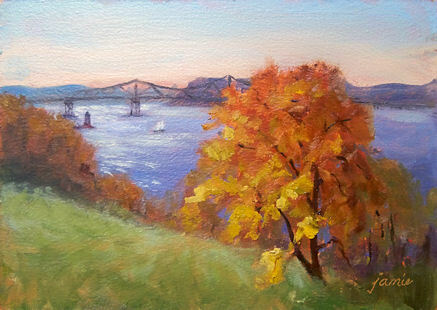 I was painting at Rockwood again, this time from up high on the hillside, looking southward downriver. You can see the Tarrytown Lighthouse from there and the Tappan Zee Bridge, with the New York City skyline in the distance. It’s a spectacular vantage point on the river. Unfortunately, a huge development has been built along the left shoreline. I took it out of the painting so I could view the scene the way it used to be! 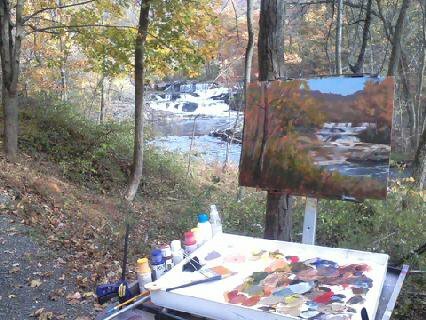 My friend Deborah and I went to paint at Rockwood today along the Hudson River. 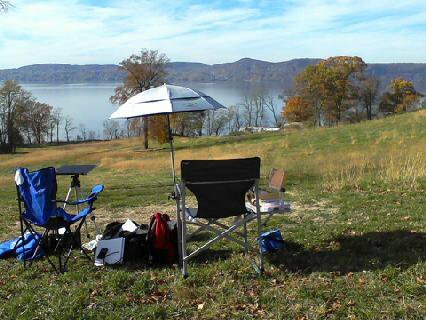 This may well have been the last of the Great Fall Days, and we didn’t want to miss it! The temperature was around 60 degrees, and the park was loaded with friendly people and happy dogs. Deb and I were pretty happy too! 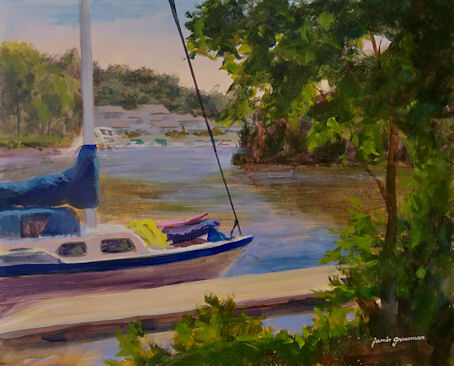 This sailboat stuck around in the field of my painting for about a half hour, tacking back and forth in the river. 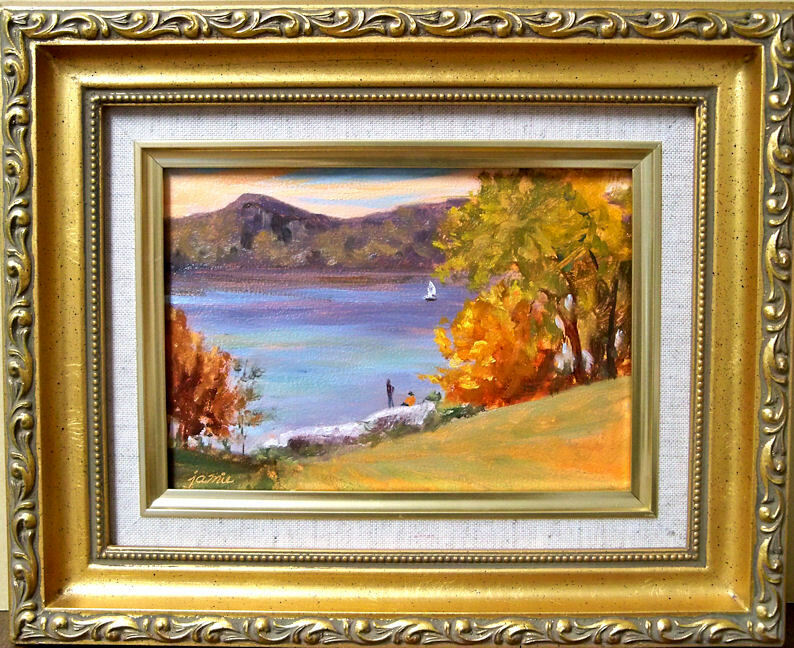 Just before I finished, a couple got up on the large rocks to admire the view, and I popped them into the painting also. $425.00 plus $20 shipping and insurance within the Continental United States. For local sales, shipping charge will be allocated to NYS Sales Tax. Please email me at JamieWG@aol.com for International purchases or with any questions. “First Warm Day at the Falls” might sound like a funny title for a painting that I’m posting in late autumn. 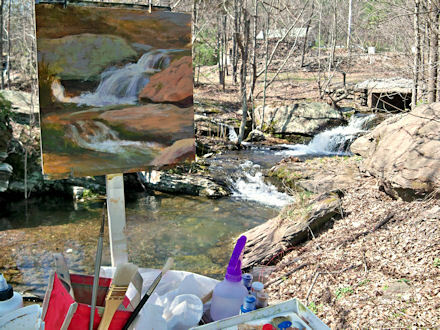 This painting was actually started in the spring, on location. It needed a few touch-ups in the studio, so finally that’s been done and it’s ready to be revealed at last. It so nice to see it finally finished up. 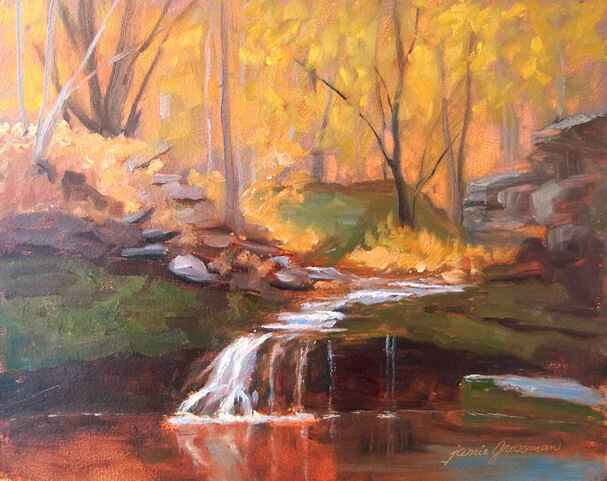 This painting will look fabulous in a warm-toned, wood frame. I have just the one! 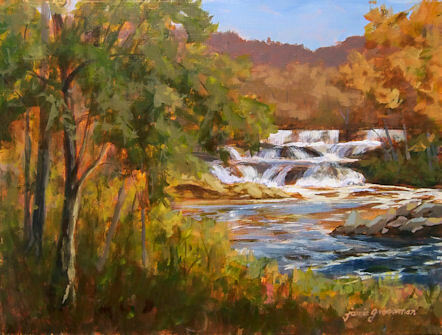 This painting was done at Tioronda Falls in Beacon, New York. There is a beautiful park there where the Fishkill Creek empties into the Hudson River. 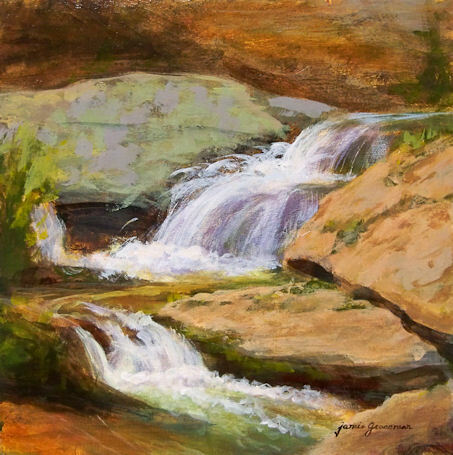 This waterfall is conveniently located very close to the parking lot, making it an ideal painting location! 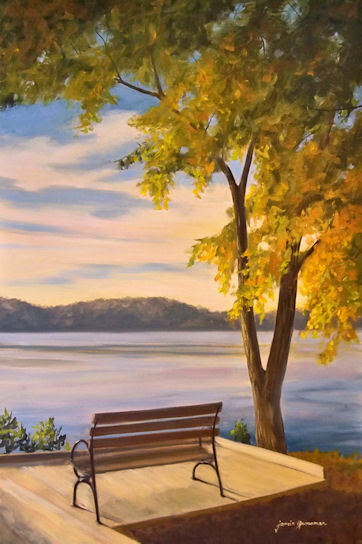 This painting was based on a small watercolor piece I did, titled Bench with a Hudson River View. You can see the watercolor version here. Whew! This has been one heck of a long day. I’m calling it a night and will continue with this painting in the morning, with a fresh eye and more energy! 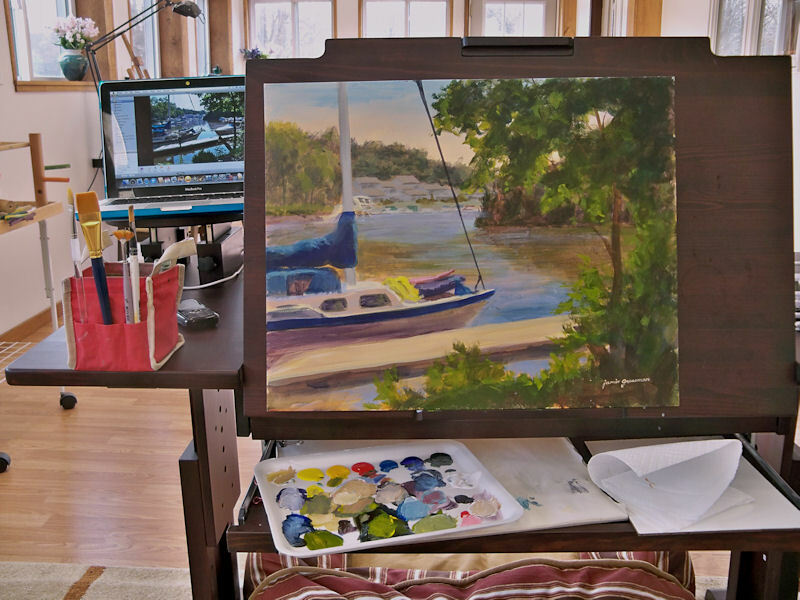 You can see next to the painting that I set my reference images on a music stand. They are light and take up so little space, and are easy to reposition as needed. 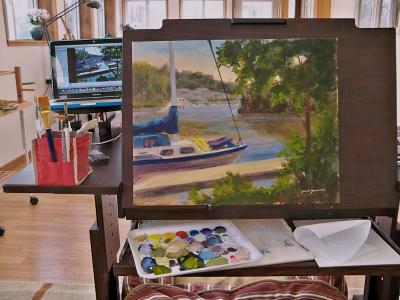 This 30×20″ painting is being done from both a small watercolor painting I did of the scene, and a photo reference. Stay tuned for the finish! 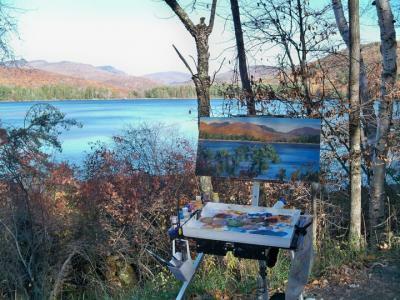 I went with a group of seven plein air painters to paint at Cooper Lake in Woodstock, New York. The lake is gorgeous, deep blue and clean, with views of the Catskill Mountains in the background. We ended up separating into two groups. Three of us went down the road and found this nice spot with a fallen tree, which added an interesting foreground element to the scene. We later found out that the other four painters had been told to leave because they’d strayed off the road, and this lake is the reservoir for the city of Kingston. 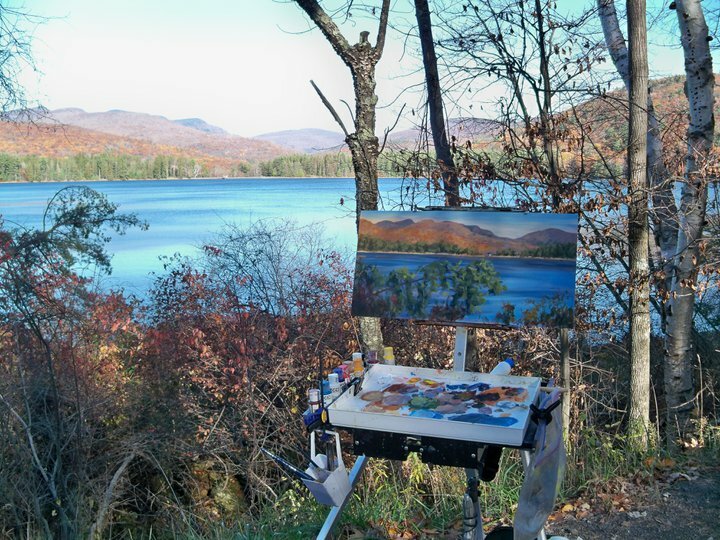 Fortunately for the three of us, you are apparently permitted to paint from any public roadway, so I got to stay. It was a little tricky setting up my gear on an island in the creek to do this painting, but worth the trouble I think!